Laomedon was a king of Troy in Greek mythology, and although the fame of Laomedon has been overshadowed by that of his son, King Priam, Laomedon himself also appeared in famous mythological tales. Laomedon was the son of Ilus, the founder of the city of Ilium. Ilium would eventually be renamed as Troy, a name given to honour Tros, the father of Ilus, and thus grandfather of Laomedon. This lineage means that Laomedon was a direct descendant of Dardanus and an important member of the House of Troy. As a son of Ilus, Laomedon was therefore a nephew of Ganymede and Assaracus. The mother of Laomedon is variously given as Eurydice, a daughter of King Adrastus of Argos, or a woman called Leucippe. Laomedon therefore, probably had two sisters, Themiste and Telecleia. King Laomedon himself was father to many children by several different women. Amongst the wives of Laomedon were Strymo and Rhoeo, both of whom were Naiad nymphs, daughters of the Potamoi Scamander, as well as other wives named Placia, Thoosa and Leucippe. Born to these various wives were several sons for Laomedon including Tithonus (the eldest son), Lampus, Clytius, Hicetaon, Bucalion and Podarces (the youngest son of Laomedon. 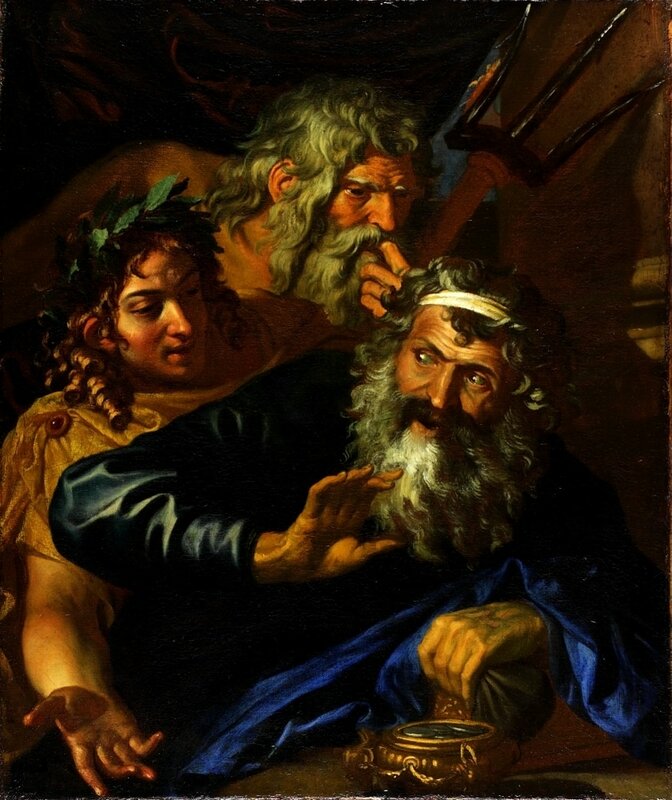 ​Initially, the most famous of the sons of Laomedon was Tithonus for he was abducted by Eos to become the goddess’ lover, although in later mythology Podarces is far more famous. Several daughters of Laomedon are also named, including Hesione, Cilla, Astyoche and Procleia. The children of King Laomedon would become important later in the story of the Trojan king. The name of Laomedon comes to the fore in a time when the Greek gods Apollo and Poseidon were to be found wandering the earth. The pair of gods had been punished by Zeus for rebellious intentions, and exiled from Mount Olympus for a year. Apollo and Poseidon came to Troy seeking employment, and thus Apollo was put in charge of King Laomedon’s livestock, whilst Poseidon was tasked with building up the walls of Troy. The mere presence of Apollo around the livestock, was sufficient for twins to be born to each pregnant animal, and the work of Poseidon, saw impenetrable walls constructed. Poseidon though, did not construct the walls alone, and he was assisted by Aeacus, the mortal king of Aegina. The sections of wall constructed by Aeacus would subsequently prove to be less secure than those made by Poseidon. After their work was complete, Apollo and Poseidon presented themselves before King Laomedon to obtain their pay for work undertaken. King Laomedon though, decided not to pay his two employees, and instead banished the pair from his realm. In retribution for the arrogance of Laomedon, Apollo sent down Pestilence upon Troy, whilst Poseidon sent forth a sea-monster, the Trojan Cetus, to ravage the land around Troy. To placate the sea-monster and curtail the pestilence, the people of Troy would periodically have to sacrifice one of the maidens of the city; the sacrificial maiden being chosen by lots. Eventually, Hesione, the daughter of King Laomedon was chosen to be the sacrifice to the monster, but even as she was being chained up for the monster to take, the Greek hero Heracles arrived at Troy. Heracles was on his way back to the court of King Eurystheus, having successful obtained the Girdle of Hippolyta, but learning of the situation in Troy, Heracles presented himself in front of King Laomedon, and informed the king that he could save Hesione, and rid Troy of the sea monster. In return for his service, Heracles asked King Laomedon to give him the immortal horses housed in Laomedon’s stable. These horses had been presented to King Tros by Zeus as compensation when Tros’ son Ganymede had been abducted by the god. King Laomedon readily agreed to the terms asked by Heracles, for it would save his daughter and his kingdom. Thus, Heracles awaited on the shoreline by the city of Troy, and awaited the return of the monster. The Trojan Cetus proved to be no match for Heracles, and the monster sent by Poseidon was easily killed, and Hermione was released from her chains. Laomedon had not learnt his lesson though, and when Heracles came seeking his reward for freeing Troy of its troubles, Laomedon refused to pay the demi-god. Heracles was obviously angry about the actions of King Laomedon, but before he did anything he first had to return to Eurystheus for he was still undertaking one of his twelve Labours. Later though, Heracles would return with 6 ships of men, the hero Telamon included, and laid siege to Troy. The walls at first held strong, but then the wall, at a point constructed by Aeacus, Telamon’s father, fell, and Heracles and his men entered Troy. It is normally stated that Heracles killed the treacherous Laomedon, and all of his sons, bar Tithonus, who was not present, and Podarces. Hesione would save her youngest brother by presenting a ransom to Heracles in the form of a Golden Veil, and so Podarces was saved. Podarces would subsequently be known as Priam, a name that can be translated as “to buy”. Priam would be placed upon the throne of Troy by Heracles, and so the son of Laomedon succeeded his father, all be it in a strange manner. Hesione, the daughter of Laomedon, would be given to Telamon by Heracles as a reward for his help, and the hero of the Trojan War, Teucer, would be their son. It was said that the tomb of Laomedon was located by the Scaean Gate of Troy. In some versions of the Trojan War it was said that the city of Troy could not fall whilst the tomb was intact. The tomb though was damaged when the gateway was enlarged by the Trojans to allow the Wooden Horse into the city, and of course Troy would shortly afterwards fall to the Achaean forces. Some sources make reference to the tomb of Laomedon being further desecrated during the Sacking of Troy, with the body for the former king removed from the tomb, possibly by Sinon.